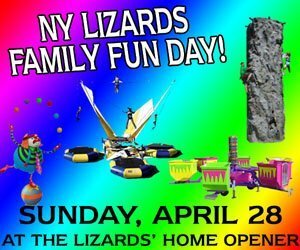 Join the New York Lizards as they celebrate Family Fun Day, sponsored by NY Party Works before the Lizards home opener this Sunday, April 28th. Uniondale, NY - April 24th, 2013 - Join the New York Lizards as they celebrate Family Fun Day, sponsored by NY Party Works before the Lizards home opener this Sunday, April 28th. The game will take place at Hofstra University’s Shuart Stadium in Uniondale. Gates will open at noon, before the Lizards face-off against the Boston Cannons at 3:30 PM. There is no additional cost to attend Family Fun Day, however a ticket to the Lizards is required for entry. Tickets to the Lizards game start at just $15. NY Party Works will have a Euro-bungee, 25-foot rock wall and the “Tubs of Fun” ride on site. There will also be a magician and juggler for all those who prefer to keep both feet planted on the ground. The New York Lizards will have their Fastest Shot Contest and accuracy shot stations also available to fans. With something guaranteed to please every member of the family, Family Fun Day with the New York Lizards is sure to be a great day out for the entire family. For more information about Family Fun Day, click here or contact Chelsey Zuckerman at (516) 742-1180 x304 or CZuckerman@NYLizards.com. NY Party Works has been in the business of entertaining people for over 30 years. We take pride in being a service oriented company that cares as much about your event as you do. Although we are one of the top New York Event Companies, we will take our services anywhere to make sure your event is spectacular. Whether you are looking for inflatables and interactives, carnival game ideas, casinos, mechanical bulls or photo novelty items and ideas, NY Party Works has it all and more. For more information on what New York Party Works can bring to your party or event, please visit www.NYPartyworks.com, or give them a call at 631-501-1414. Subject: LongIsland.com - Your Name sent you Article details of "The New York Lizards Family Fun Day Comes to Hofstra This Sunday!"